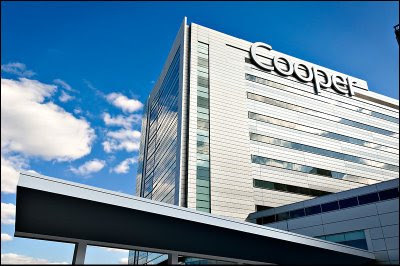 This image was just created for Cooper University Hospital in Camden, NJ. I was contacted by the marketing director because they wanted a photo of their new $220 million dollar patient care pavilion for a PR release inviting the media to their grand opening. The only problem was that the outside of the building was not finished. They didn't have the budget for me to scout the facility in person so that part was done by looking at snapshots that were sent to me and by surveying satellite images of the site. Because there was no landscaping and the ground was filled with construction equipment and workers I decided to shoot up on it and eliminate ground level. This would also make it look heroic and more important. After determining what approach that I was going to take, the sun positions were calculated for the day of the shoot. 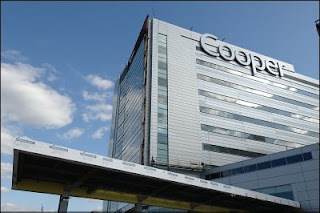 I wanted the brightest reflections to be near the Cooper sign, and figured 1-3 pm was my window of opportunity. This was shot just after 2pm. When I'm shooting an image like this, my primary thought is that of capturing information. I know that I'm going to be working on the image to give it more drama. When an attempt is made to do that in camera, there's a huge risk of losing highlight or shadow detail that can never be recovered. The canopy and fascia on the front of the building (the sign is on the side of the building) had to be constructed in Photoshop be me using the architect's rendering as a guide. There were also many wires coming down from hoists on the roof. These were also reflected in windows and casting shadows. The retouching and enhancing took me about 8 hours to complete. They now have an iconic image that they'll be able to use for years. You can see more architectural images in my architectural photography portfolio.